This page is designed as an educational hub for my puppy buyers. Anyone is welcome to look around…..
By OVER VACCINATING our beloved pets, we have inadvertantly been destroying their immune systems. Cancer along with a miriad of auto-immune disorders is rampant in dogs. This topic is so VERY IMPORTANT. You are the BEST and ONLY advocate for your puppy. If you don’t take a stand on your puppy’s health, who will? You’ll need to dig your heels in and INSIST on Dr. Schultz Protocol. It’s difficult to change, especially when we’ve all grown up with the idea we are good pet owners to vaccinate often. Even though Dr. Schultz brought this up over 30 years ago, we are FINALLY LISTENING. Think about this….We only vaccinate our children once for a disease. Why would it be different for our dogs? I have the liturature and also a letter for your Veterinarian, so you will be armed with knowledge at your first visit. Stand your ground. Don’t give in. Slowly, the Veterinary community is coming on board. You have to understand Vaccinations along with spay/neutering is the main source of revenue at the clinic. The Veterinarians that haven’t kept current on the liturature, will not want to loose this income. With the development of the VacciCheck Titer test (see below) instead of yearly vaccinations, a yearly HEALTH TEST/PHYSICAL is advised. Along with the health physical, ask for the inexpensive IN HOUSE titer test called the VacciCheck. This will tell you if your puppy still has immunity for Parvo and Distemper. CLICK HERE↓ Dr. Schultz Shares Vaccine Info With Dog Owners- Great Beginners Guide to Understanding ∗ Vaccines are something that every dog owner should be educated about, and yet few seem to think about them at all, except to wonder about the need for them after they get a new dog. However, many people base this concern on the vet bill, rather than worries about the potential for side effects in their dogs!……. So when you consider the fact that many vets administer dog vaccinations that contain bacteria or virus for two, three, five—even SEVEN diseases, you can see how this can adversely affect your canine best friend in a huge way, perhaps crippling his immune system for life. When a canine receives a “three-in-one” or “five-in-one” vaccine, his body is creating antibodies to fight off multiple diseases at the same time. Is it any wonder his immune system is compromised?……. 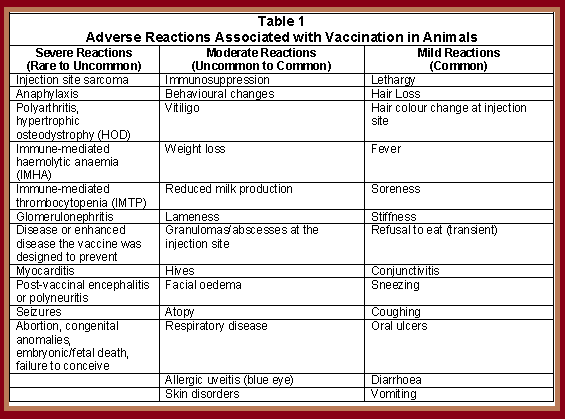 Over vaccination-Dog Owners Beware PDF ⇐⇐click Over-Vaccination-Dog Owners Beware ∗ A “titer” is a measurement of how much antibody to a certain antigen is circulating in the blood at that moment. The result is usually expressed in a ratio. A positive titer test result is strongly correlated with a good antibody response to either a recent infection or vaccination. A dog who has received “core” vaccines and who displays a positive antibody titer test result should be considered protected from the diseases for which he was vaccinated (meaning, he doesn’t need vaccines at that time). See WDJ blog entry, “Vaccine Titer Tests,” for more insight……..
CLICK HERE↓ Vaccinosis: Health Hazards of Pet Vaccines ∗ Most pet owners aren’t aware of the dangers in animal vaccinations that have been discovered in recent years. Major veterinary associations now agree that immunizations can trigger all sorts of maladies, from allergies to cancer – but most pet caretakers (and many veterinarians, it seems) haven’t gotten the word……..
Dr. Donna Starita Mehan, DVM – “With vaccines that are repeated year after year, the frequency and severity of these side-effects in our pets has increased dramatically. Most of the problems involve the immune system. After all, the immune system is what vaccines are designed to stimulate. But they do so in a very unnatural way that can overwhelm and confuse the immune system.”……. CLICK HERE↓ Titer Testing FAQ’s ∗ Giving additional vaccinations to a dog or cat that has a positive titer for a particular disease will not offer more protection, is a waste of health care dollars, and could be harmful if he reacts adversely to the vaccine. Positive titers indicate your animal is protected and vaccines can be skipped that year……..
CLICK HERE↓ VacciCheck–Show Your Veterinarian the inexpensive “In House” titer test (under $100) ∗ Veterinarians need to administer the rabies vaccine as defined by law, but other core vaccines for canine distemper virus (CDV), parvovirus (CPV-2) and canine adenovirus-2 (CAV), are administered more often than necessary. Vaccines are largely safe, and are intended to improve the health and welfare of animals, but when problems do occur and the animal didn’t even need the vaccine, that’s unacceptable……..
CLICK HERE↓ Key Facts about Canine Influenza (Dog Flu) Canine influenza (also known as dog flu) is a contagious respiratory disease in dogs caused by specific Type A influenza viruses known to infect dogs. These are called “canine influenza viruses.” Dog flu is a disease of dogs. No human infections with canine influenza have ever been reported. There are two different influenza A dog flu viruses: one is an H3N8 virus and the other is an H3N2 virus……..
CLICK HERE↓ Non Core Vaccines For Dogs ∗ The core vaccines include parvovirus, distemper, adenovirus (canine hepatitis) and rabies. These vaccines all protect against viruses, which are easy to protect dogs against. In fact, viral vaccines are so effective that, when given to a dog over four months of age, they’ve been scientifically proven to protect that dog for years, and most likely for life……..
That’s a pretty scary list.